I tested these glasses in 2015 and obviously it would be wrong to rewrite and update reviews without having the same samples at hand. So here in a nutshell is what I learned since then, also by looking at other samples over the last years. is still an attractive glass due to ease of view and a beautiful image in a very solid and small package. 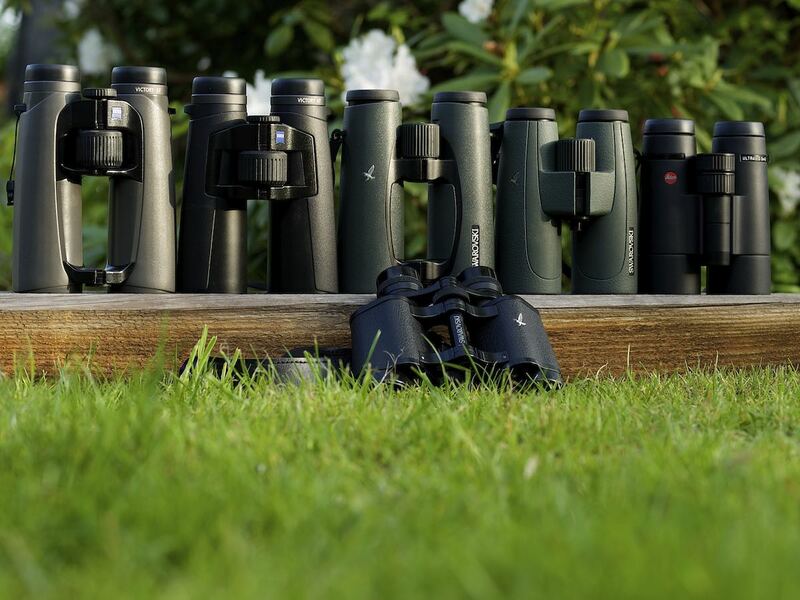 But the 7x42 is even sharper and much brighter - really one league above, and seriously rivalling the Noctivid, at least if you value ergonomics and rock solid mechanics - so for me the 7x42 was the better choice than the 8x42 in the end. is for my taste optically the nicest 8x42. I am not a big fan of double hinge designs and the weight of this glass though. And sample variation seems a bit too high still. is still a very desirable but also a bit mysterious glass to me. My main issue against it was that the image seemed a bit too dark. But then maybe that was due to the state of the art flare suppression? Also I do not know if Nikon changed coatings over the decade since the EDG war introduced. I suspect the last batch of this glass is being sold, with a now ridiculous list price and hugely increased street prices. is a very interesting glass for me but in this sample was simply not on the optical quality level of the Ultravid, EDG and HT. I would like to urge Swarovski to take this glass to Swarovision quality levels to compete with the other compact, central hinge designs. has three issues for me: As a true flat field design it renders terribly flat, pronouncedly 2D images. That is ok for star gazing and mainly observing at infinity. But for most birders I see this as a big disadvantage. Moreover, quite prone to flare. And with a distinct bluish colour reproduction unlike any other glass in this shootout. is no longer available. I have owned a Zeiss Victory 7x42 for a year, the HT´s predecessor model which seems to be a very similar glass. Both binoculars are way brighter than the rest, and also sharper. AK prisms rock. But with both what finally made me fall out of love was the not sufficient ease of view, probably due to rather strong, undercorrected aberrations. I am happy to say I played around with the MK2 version and this is now a real contender for best 8x42. Colour reproduction was changed from greenish to neutral, ergonomy and focus are great, sharpness and contrast premium league. This is the bulkiest glass though. The biggest issue for prospective buyers is if they find the strong distortion and warping of the image acceptable. I probably would not. As far as sample variation is concerned, my personal statistics clearly favour Swarovski, with Leica and Nikon being very far from perfect and Zeiss being even worse. A big thank you to Nanette Roland at Leica Germany, Sabine Sperwer at Nikon Germany, Lydia Kalb at Swarovski Austria, and Michaela Sulz at Zeiss Germany for kindly providing me with the test samples. 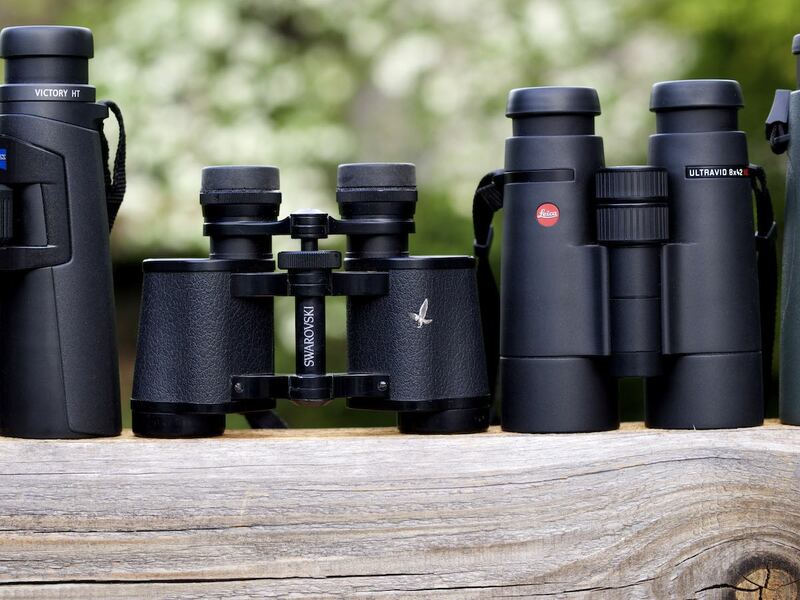 These legendary companies have awesome binoculars in their portfolio. As a buyer, you just need to find the right one for your needs and taste. I hope these reviews provide a starting point for you. I really wanted to review some of the best 8/8.5x42s for a longer than usual testing period simultaneously to get a good impression of the character and qualities of each glass. Because memories will not help in serious comparing. With a grain of salt, the reviews should be valuable for comparing the 10x versions, too. Ethics statement: I am not paid by any manufacturer nor do I have any agenda. This is my entirely personal view. It has to be subjective. Your needs and expectations are probably different from mine, AND YOU MIGHT GET A VISIBLY BETTER OR WORSE SAMPLE THAN ME !!!!!!!! Here we have: The Leica Ultravid HD Plus 8x42, the Nikon EDG 8x42, the Swarovski SLC WB 8x42, the Swarovski EL Swarovision 8.5x42, the Zeiss Victory HT 8x42, and the Zeiss Victory SF 8x42. Plus my trusted Swarovski Habicht 8x30 as reference for on-axis performance. What a set of binocular personalities! The main method was watching under many different conditions but in familiar settings, everyday, if possible a couple of hours a day. I used a Gitzo tripod with a small video head and tripod adapters most of the time, complemented by handheld viewing. On excursions I prefered to take just two binoculars for better comparison. Good test objects need to provide a high contrast, be stationary and have a huge variety of shapes, textures, colours and be at different distances. The plants in my garden and the surroundings provided all this, with light from early morning to late evening, and hopefully with some raindrops on a dull day. Of course I watched birds as often as I could, but never managed to watch the same bird with all five binoculars. In the second period of reviewing, in autumn 2015, I dug deeper - more observations handheld, on dull days, and late afternoon into the darkness. 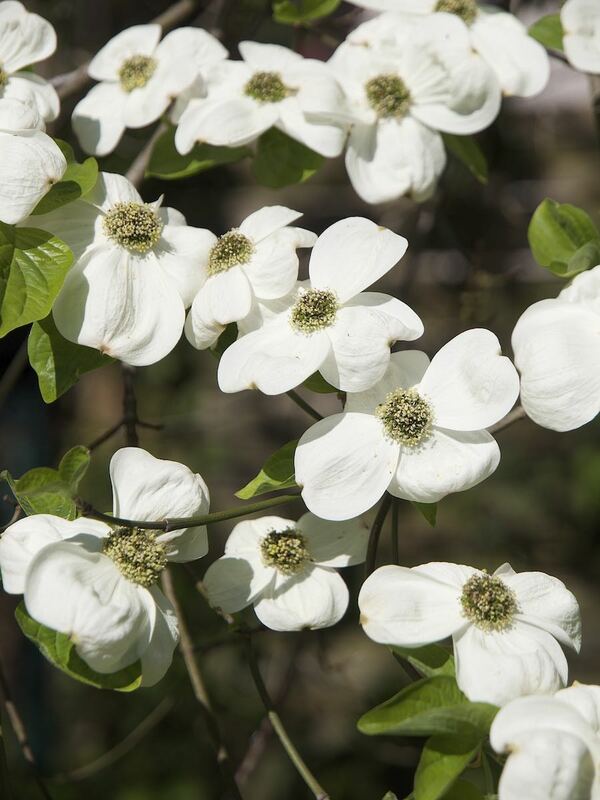 The whiteness and brightness test - White flowers are useful for this, in backlight, in frontlight, in the shade, in the twilight. 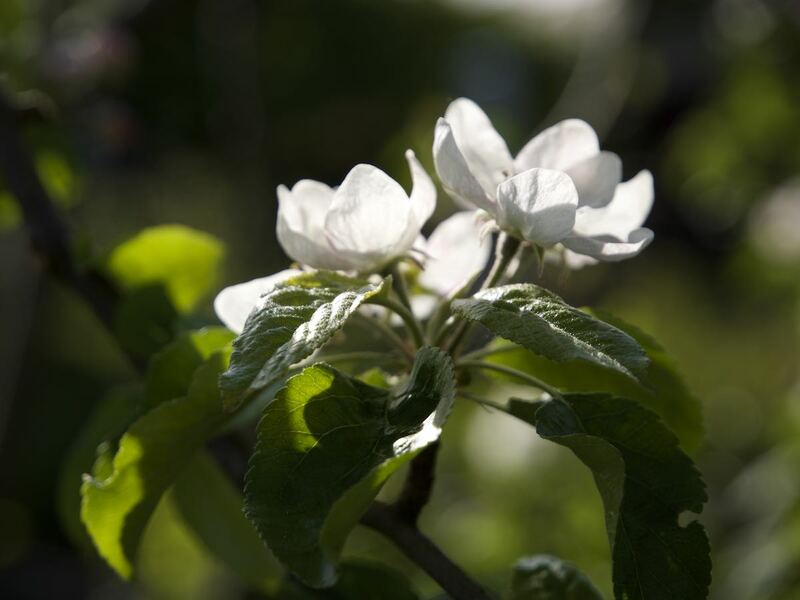 Apple, rhododendron and Cornus nutalli blossoms. 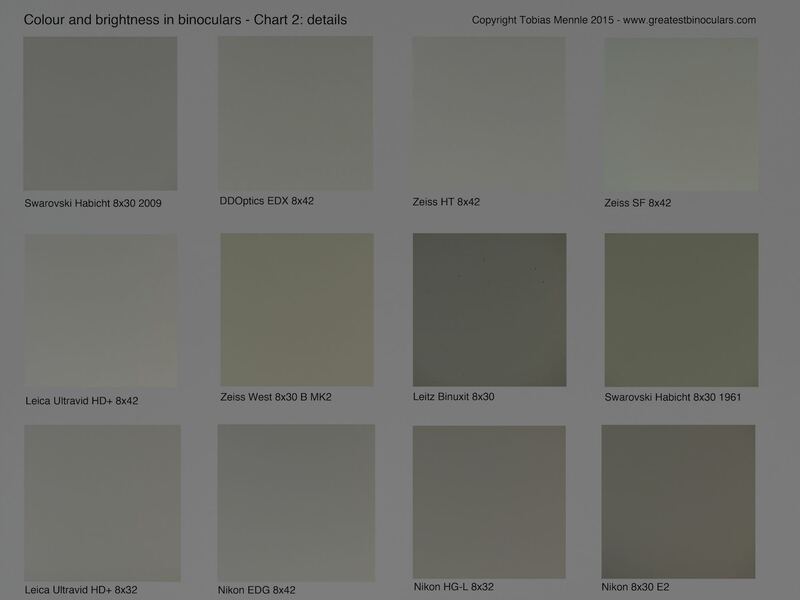 Great for checking out the bright parts of the tonality range. 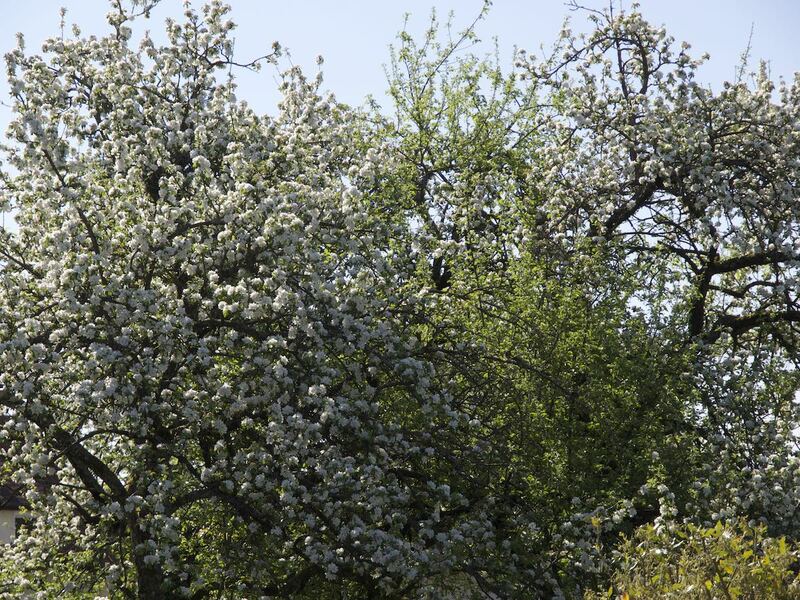 The apple tree flare test - blooming apple trees against morning sun with a huge contrast of white blossoms and dark shaded bark and twigs reveal mercilessly if and where the flares and veiling glares turn up. 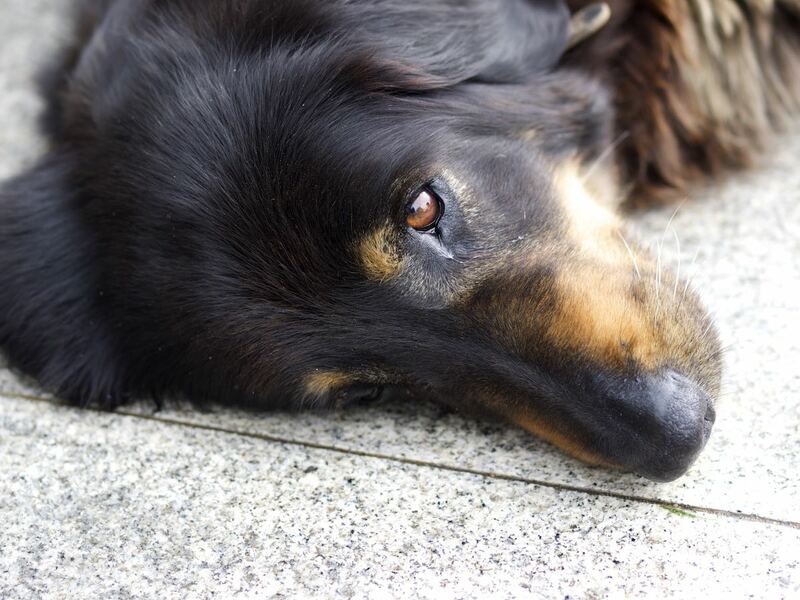 The dog test - my Hovawart is always dusty, with shining wet eyes, providing fine detail plus strong contrast, like yellow pollen in black fur. The 3D test - flowers and the trunk of my dwarf pine are reference points for how threedimensional the images look. 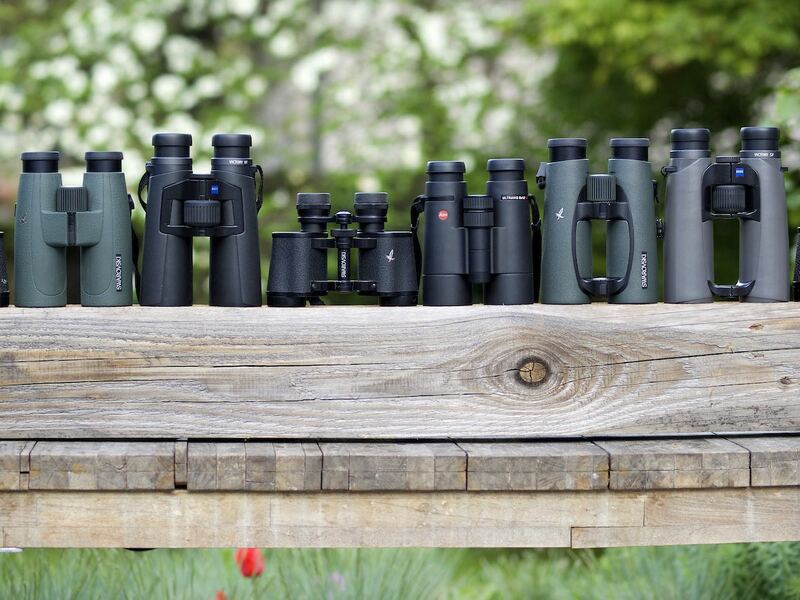 Guess how the modern flatfield binos compare to the classic designs. 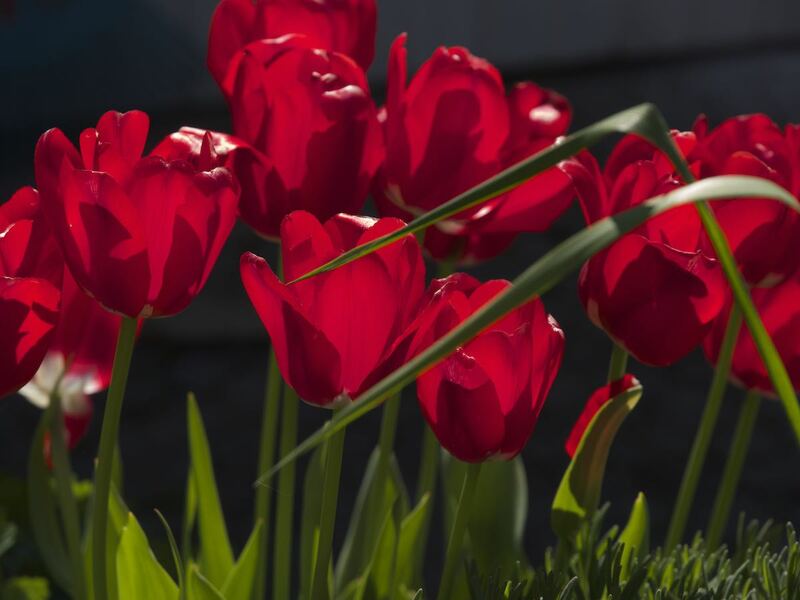 The red tulip test - how saturated are the warm tones? One word: Ultravid. The skin tone test - family members indoors and outdoors. In cinematography, all camera and lens tests are first and foremost about skin tones, so a binocular with a yellowgreen cast will not make people look good. The starling on a dead branch test - having the bird sing on the dead topmost branch, especially with overcast, white sky, is the best test for chromatic aberration. 4. Tripod mounted, objective unmasked or masked, with 20mm opening, with Zeiss 3x12 booster and 2 inch Edmund Optics USAF 1951 glass negative, put on a Rex lightbox, indoors. Resolution test and visual contrast judgement. The use of a booster has its own problems, but this time fitted quite well with my impressions from tripod mounted use. My guess is that most manufacturers optimize their binos for handheld use. If they look sharp enough handheld, most customers will be satisfied. A closer look with boosters will reveal deficiencies which may disturb the tester but be irrelevant for ordinary use. What is the main character of each glass? What are the main pros and cons? Three of these binoculars were designed with flattened image fields, trying to minimize a loss of sharpness towards the edge of the view that occurs with curved fields. The EDG really has the quietest view of the whole lot, as it is most resistant to flares and has a well implemented flat field with slight pincushion distortion and no rolling ball effect. Also, vignetting and aberrations that could spoil the image periphery at open pupil seem very low. The view is really extraordinarily comfortable. Combined with extreme sharpness, maximum contrast and highest colour saturation images have a stunning punch. But compared to the newer high transmission glasses, the EDG images are darker and lack the lovely bright and vivid sparkle of an Ultravid, HT or Habicht. This is a shame, as the EDG would otherwise clearly be my favourite, as the optics are flawless and are complemented with perfect mechanics in a small handy package. The focuser is velvety smooth going even at -18°C and simply makes all other focusers look and feel like rubbish. I really mean it. Every decision maker at Leica, Swarovski and Zeiss should have an EDG and play around with this focuser on a daily basis. A real flat field with stunning edge sharpness, and a design optimized for an amazing ease of view. Only the Swarovision lets you roam around in the image by eye movement only, without any strain or blackouts. I guess the weak baffling makes the exit pupil very accessible under many situations, for best ease of view. The trade off is a bit more flare than usual. Biting sharpness and the coldest colour reproduction of the whole lot. Threedimensionality is the worst of all though, with condensed space and rather flat looking objects. The SF´s main character trait is the widest field of view in its class. Sharpness is good over about 75% of the field which is right inbetween classic designs (HT, SLC, Ultravid) which look reasonably sharp at about 50% of the field and the Swarovision which yields a 100% sharp field. Much better threedimensionality than in the Swarovision though. There is a pronounced rolling ball effect, depending on object distance and object structure which I found unacceptable in the long run, as I am not getting used to it. Flare suppression is good, especially for peripheral crescent flares and "flashes", but veiling glare does occur. Colours are very warm - which I like in principle - but they also have a SLIGHT green cast to increase perceived contrast at the expense of colour accuracy. I strongly object this look and approach but acknowledge most people will not be affected in any way. It is easiest to see in midtones like grey bark, or peoples´ skin tones, or reds and purples that look more subdued than in the competitors. They lose sharpness towards the edge of the image, but generally have a more immersive, threedimensional feeling image. Most saturated colours, combined with great sharpness and microcontrast in the center yield outstandingly beautiful images. The SLC is most similar colourwise but duller with less punch and sparkle. The Ultravid is a bit more prone to peripheral crescent flares than all others, nevertheless macrocontrast often class leading together with the Nikon EDG. This fits with the high colour saturation, because strangely the Ultravid manages to keep the image center almost free from veiling glare. The view is very easy even with open pupil, and the field of view feels much wider than it actually is. Mechanical quality is good, and industrial design is marvelous. I admit I am very fond of the Ultravid, for my taste it has the most beautiful image with that magic sparkle that gets you addicted immediately. I suspect the SLC has been downgraded a bit compared to its predecessor to conquer a new niche below the premium model Swarovision. The SLC looks a bit softer than the others, especially below 10 meters, and does not quite achieve the wowing view of an alpha bin. That´s annoying because the design is well balanced, the view is very comfortable, and the price and brand suggest premium quality. The focuser is squeaky and rough, and the industrial design looks strange and old fashioned, lacking appeal. Swarovski should really let the SLC be a premium alternative to the Swarovision for those prefering curved fields. In Europe, street price is way to close to the superior Ultravid and HT to make the SLC a good buy, in the US this might be different though. 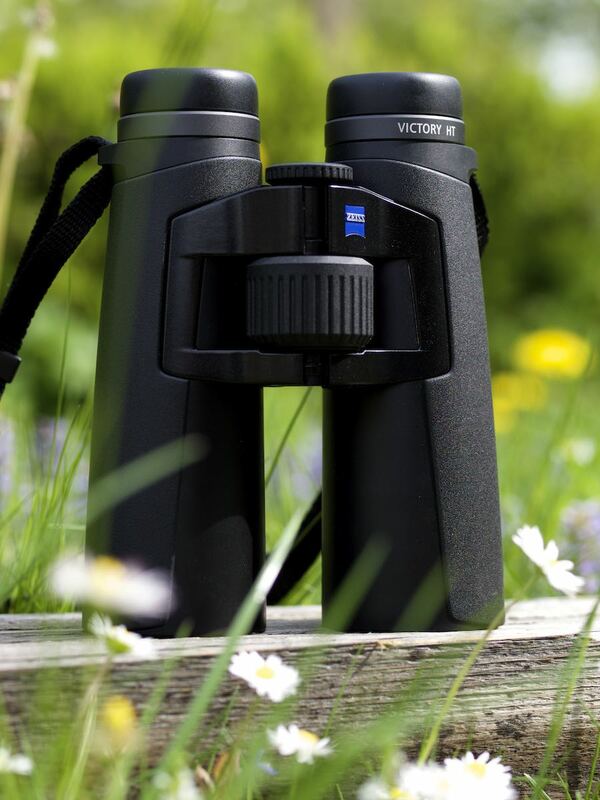 Zeiss Victory HT 8x42: The HT is about maximum brightness with extremely sharp, sparkling images. Good flare suppression. Very neutral colour, not as warm as SLC and Ultravid and due to the high brightness less saturated than in the Ultravid. Superb macrocontrast, great sharpness and extreme microcontrast give it an incredibly chrystalline image with almost surreal punch. Best threedimensionality, really unusual for a roof prism. Probably the most realistic view and technically the best image of the lot. Mechanically it is good, but the long bulky body needs to be held close to the front, putting a long leverage to the whole system which I don´t like. The predecessor was shorter and more compact, maybe that was a better solution? 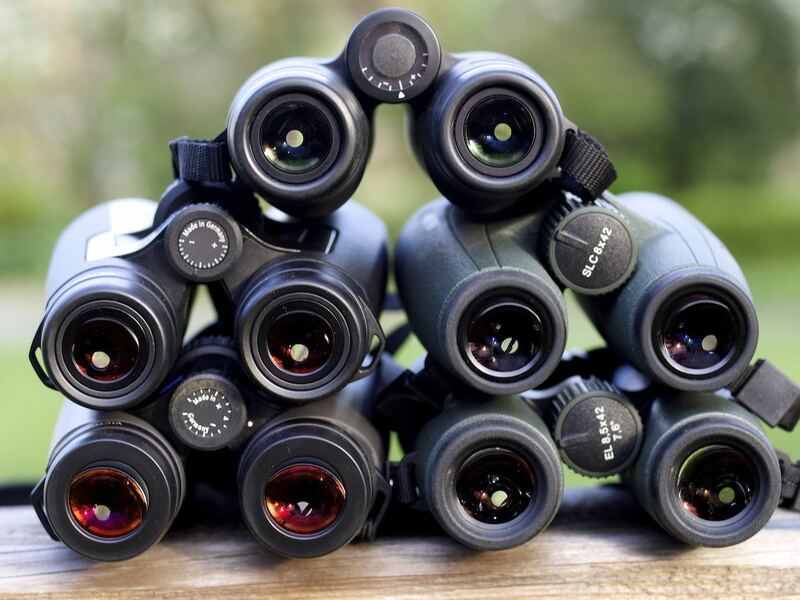 These are all great binoculars, and there are so many variables, situations, observations... and definitely many personal subjective preferences! While ranking binocular models is total nonsense, ranking for specific qualities does make sense, so here is my try. 1. Nikon EDG. Incredible, perfectly smooth focusing - this is what it should be. Less than one revolution for focusing from 2.2 to infinity. 2. Zeiss HT - very low friction, but evenly going, focus is really at the tip of your finger, short focus gear with about two revolutions from infinity to close (basically the same length as in the Zeiss SF, so what is "smart" about the Smart Focusing???). 3. Leica Ultravid. First sample was very nice, but the second sample much rougher in focusing. 1.1 revolution to focus from infinity to close. 4. Swarovski Swarovision - a bit unevenly going, but flying birds are very easy to follow with focus. Acceptable, but could be better. 5. Swarovski SLC and Zeiss SF samples had issues with focusing, see reviews. Out of competition: Swarovski Habicht. Focuser will become stiff at low temperatures. 4. Swarovski Habicht - some rather shiny metal rings behind the objectives, which are much better blackened in my 1961 sample! Zeiss Victory HT 8x42. Darth Vader: "The force is strong with this one." 1. Leica Ultravid - has 8 click stops effectively, as you can not only fix the cups into the stops going upwards, but lock them also against the stops going downwards. Thanks to Renze de Vries for pointing this out to me. 2. Swarovski Swarovision, Swarovski SLC - they all lock securly, have three click stops - four positions and a soft rubber layer. 3. Zeiss HT and Nikon EDG - eyecups have occasionally unlocked and slipped back a bit. Both have three click stop positions - four positions and a soft rubber layer. 4. 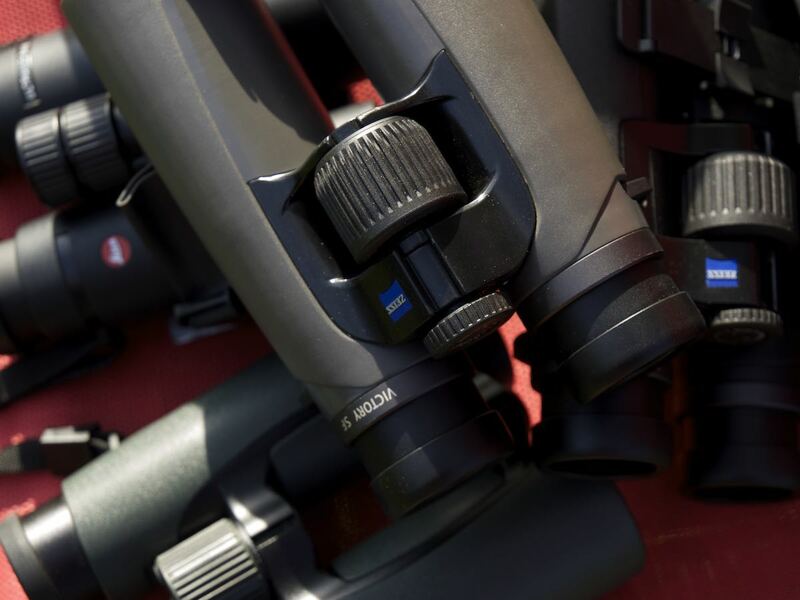 Zeiss SF - secure locking and rubber layer with extra baffling, but only two click stops - three positions. 5. Swarovski Habicht. Simple rubber eyecups. I prefer to hold compact designs close to the face, which is impossible with the open double/triple hinge designs. 1. Nikon EDG - again, a league of its own due to compact size, excellent rubber texture and most of all the state-of-the-art focuser. 2. Leica Ultravid - because it is so compact and my hands stay close to the face. 4. Zeiss SF - center of gravity close to the face. 5. Zeiss HT, wish it were shorter and more compact like the predecessor. 6. Swarovski Swarovision - index finger needs to bend back for focusing if you want to have a firm grip inbetween the hinges. Out of competition: The Swarovski Habicht fits beautifully in my hands. Leica Ultravid 8x42 HD Plus. Bauhaus meets Coco Chanel. 1. SPECIAL PRIZE: Leica Ultravid. Anyone can wear it anywhere, anytime - and look good. 2. Swarovski Swarovision - hunter´s green will not fit with your woman´s little black dress like the Leica, but the shapes and textures are superb. 3. Nikon EDG. Batman´s choice really grew on me, although the shiny badges look so tasteless nouveau-riche. 4. Zeiss HT - Science Fiction instead of tradition, but it does have a clear and well defined shape. 5. Zeiss SF - Swarovision turns from modern to baroque - or gothic? - and the details look arbitrary. 6. Swarovski SLC - keep it ugly, so people start saving for a Swarovision... the predecessor which was in the same price league as the Swarovision was also built in the same quality. I know the hunting market is most important, but is the average hunter really that conservative??? But if I think about an SLC with slightly improved optics, a really smooth focus wheel, and some cool black leather finish... that could easily be a favourite. Out of competition: Swarovski Habicht. Since 1949. You gotta love those porros. Swarovski SLC W B 8x42 special edition "Jurassic Park". 1. Macrocontrast - how black are the shadows? Flare suppression is paramount. In practice, there are two main issues: The annoying, often crescent shaped peripheral flares that flash into your view when scanning the scene, and the veiling glare that makes the view look milky and low in contrast. 1. Again the Nikon EDG hands down beats the competitors by a safe margin. 2. Zeiss SF - very good suppression of peripheral flares, but some veiling glare at times. 3. Zeiss HT seems to suffer a bit more from peripheral flares then the SF. 4. Swarovski SLC, Swarovski Swarovision - very good, but Zeiss has set a high standard. Swarovski has a different philosophy in internal baffling, emphasizing ease of view instead. 5. Leica Ultravid - the small size probably accounts for a higher level of peripheral flares than in the competition. 1. As you might already suspect... Nikon EDG. 2. Leica Ultravid - it really took me a lot of time to realize that the Ultravid despite the peripheral flares manages to keep the image center very clean and flare free most of the time. 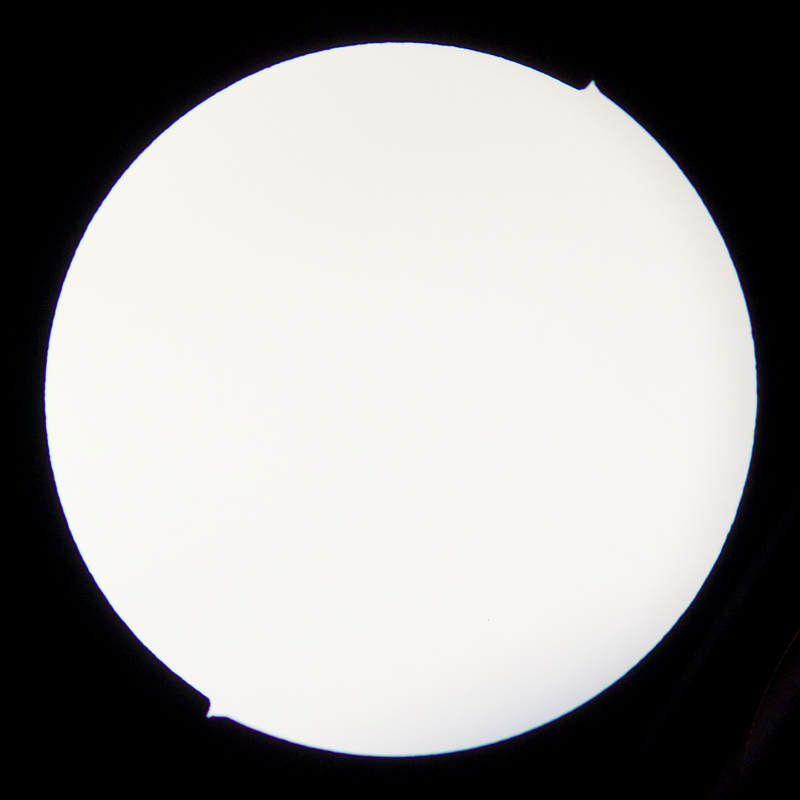 This also explains the paradox of flaring and high macrocontrast. 3. Zeiss HT, Zeiss SF - many different situations, many different outcomes, sometimes the SF is better, sometimes not. 4. Swarovski Habicht is similar to the Ultravid - quite often, very low veiling glare in the center of the image. 4. Swarovski SLC, Swarovision - see above. From experience it seems to me to be a quite simple equation: Dark images look punchier than brighter images with the same contrast range. Most compelling example is comparing Nikon EDG to Leica Ultravid and Zeiss HT under circumstances when they are all basically free from flare. All three offer an excellent contrast range with state-of-the-art contrast transfer and sharpness. But the Nikon being darker crushes the shadows more into black and looks extremely contrasty and colour saturated, whereas the bright HT looks whiter with way less saturated colours. The Ultravid is in the middle, with pleasant colour saturation and dark shadows, rendering the most balanced and emotionally satisfying image at least in the center of the view. Comparing the Ultravid 8x42 to the Ultravid 8x32 yields similar results - the smaller glass is a bit darker even at daylight and looks even punchier. 2.1 Sharpness: Contrast at the edges of coarse objects, defining the contours and shapes of objects, for crisp, punchy images. 1. Nikon EDG, Swarovision, Swarovski Habicht, Zeiss HT - surreal sharpness. 2. Leica Ultravid - great sharpness that feels pleasantly natural, with wine we´d say: "full bodied". 3. Zeiss SF - very good at infinity, but suffering a bit below 10 meters. 4. Swarovski SLC - similar to the Zeiss SF in weak close up performance, but a bit less punchy than the SF at infinity. 2.2 Textures: Contrast of smaller details, which is needed to render textures well and get vivid, chrystal clear images. Many binos are sharp enough at first glance, but only really good textures make an image rich and satisfying. A great binocular will have very high contrast at the textural level, and I´m sure that high contrast throughout our visual passband down to the resolution limit of the eye is important for best images. More on that soon. 1. 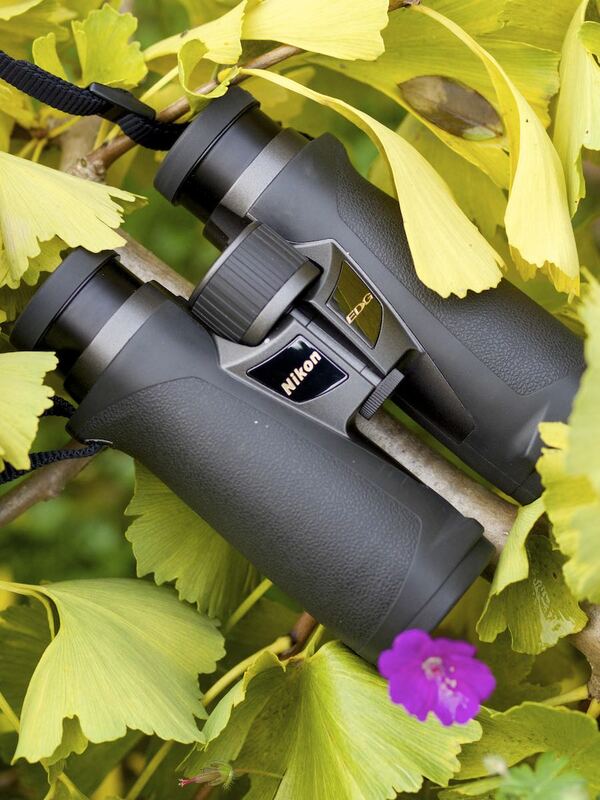 Leica Ultravid, Swarovski Habicht, Swarovski Swarovision, Zeiss HT - views like these is what all the fuss is about. They put a smile on my face everytime I use them. 3. Swarovski SLC. For both, we are probably talking about sample variation here, not design faults. 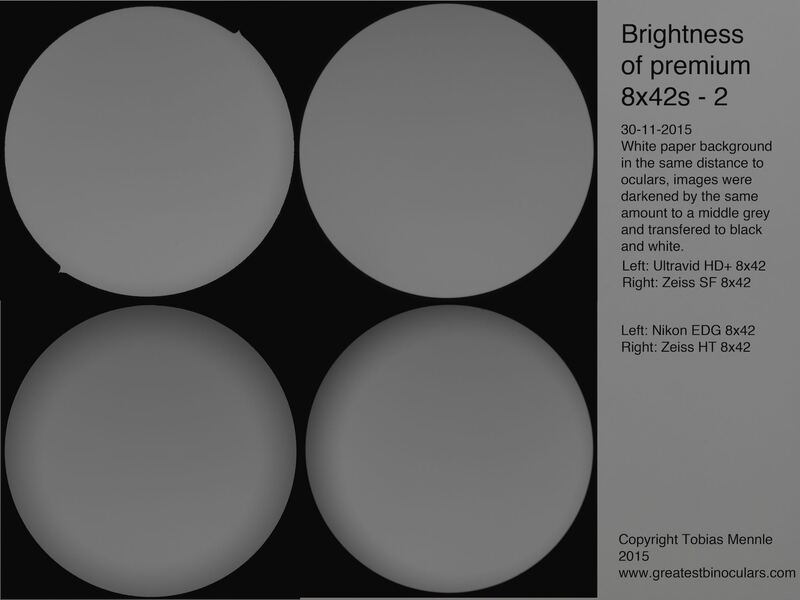 2.3 Resolution: Contrast at the level of the smallest details the optics can differentiate. In practice not relevant, although a high resolution might be correlated with a high contrast at the resolution limit of the viewer´s eyes. For all three, resolution was 3.79 arcseconds at 8.56 m distance from the chart, and 4.06 arcseconds at 4 meters distance from the chart, surpassing the DIN ISO 1433-2 norm of 5.7 arcseconds by a good margin. For these two, resolution at 8.54 m distance was 4.26 arcseconds, and 4.56 arcseconds at 4m distance, surpassing the DIN ISO 1433-2 norm of 5.7 arcseconds by a good margin. The 30mm Habicht is at a disadvantage due to smaller objective size. Resolution with objectives masked to 20mm (2.5mm exit pupil size) was 6.77 arcseconds at 8.56 meters distance and 6.44 arcseconds at 4 meters distance for all tested glasses. 1. Nikon EDG, Swarovski Habicht, Swarovski SLC, Zeiss HT - pincushion distortion for perfect panning and tilting. 2. Leica Ultravid - although it has strong pincushion distortion, it feels a bit more nervous when panning compared to the HT. Not a real issue, but something I noted. 3. Swarovski Swarovision - complex distortion, but only little rolling ball effect. 4. Zeiss SF - complex distortion, strong rolling ball effect, will be annoying to some and irrelevant to others. 3D means primarily the phenomenon called stereopsis, which does mainly depend on the baseline, that is the distance of the objective centers once you have adjusted your interpupillary distance (IPD) on the oculars. Some glasses have zero difference between objective center-to-center distance and ocular center-to-center distance, and others do have wider spaced objectives compared to the oculars, so that the stereo base and 3D perception is increased. 2. Zeiss HT: 6mm due to AK prisms. I did not measure the Swarovskis. For closer observations, a wider stereo base generally makes ease of view worse, because both images show increasingly different perspectives on an object (parallax) the closer it gets, so our vision finds it harder to combine these seperate images into one. But there is more to the rendering of space. It definitely looks to me as if a classic curved field gives a much threedimensionally looking space than a modern flat field. That´s one reason why the Swarovision is not good in 3D. Hollywood director of photography Shane Hurlbut in his blog discusses "why we want flat glass" . And in his video review - check out from 2:00 - 5:00 for the most important argument - he concludes that the latest flat glass lenses are only "good for shooting sheet metal", not for emotional portraits of human faces, and that the modern flat field approach "is a really bad idea". He and his director much prefered to use classic Cooke S4 lenses with their curved field, not the latest flat field Leica glass. The Cooke lenses can easily be spotted by their unique aperture shape which affects bokeh, so I happily started to look for their rendering when watching movies on bluray (one good example is "Pride and Prejudice" with Keira Knightley). As Hurlbut´s argument is only about 2D films, it will apply to binoculars, too, as we need to see these effects in each barrel - we are not dealing with real stereopsis but with perceived threedimensionality. Except field curvature and distortion, there should be other factors influencing our perception of space in an image. The SLC for example has a very soft bokeh probably resulting from slightly undercorrected spherical aberration, so that objects especially below 10 meters are nicely separated from the background, which may improve the 3D perception. 1. Swarovski Habicht - great old porro. You´ll want to touch what you see. 2. 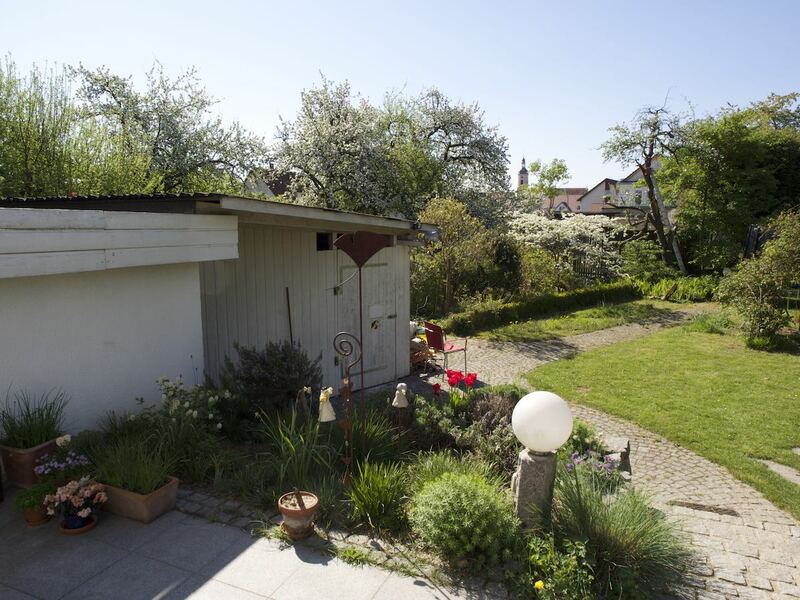 Zeiss HT - halfway between roof and porro, awesome 3D for a roof. 3. Zeiss SF - the wide view also helps, becauser there are always more objects in the image field than in the others, giving the illusion of a great depth of space, and the not really flat field will probably give the SF a big advantage over the Swarovision in this respect, too. 4. Swarovski SLC nicely separates close objects by means of soft bokeh. 5. Leica - nothing special, typical roof, but colours make up for that and the curved field does give a more threedimensional feel in close ups than in the Nikon EDG. 6. Nikon EDG - the price of flat field, space feels a bit flatter than in most competitors, although perfectly acceptable. 7. Swarovski Swarovision - flat field, very flat images, but the extreme sharpness does counterbalance that quite a bit. 1. Nikon EDG focuses to 2.2 meters, where it still yields a very comfortable view with perfect sharpness. 1. Swarovski Swarovision, Zeiss HT - 1.5m. You will experience severe eyestrain when using these glasses at closest distances for a longer period. Reduce interpupillary distance and slightly increase your distance to the oculars. 3. Zeiss SF, 1.5 meters, but not as sharp and with less ease of view compared to an EDG. 4. Leica Ultravid, about 3 meters, with a very comfortable view and superb sharpness. 5. Swarovski Habicht, about 3 meters. The Habicht yields a unique 3D experience, from 4 meters and further I´m quite happy, 3 meters is more eyestrain, but extremely sharp and impressive and even more so comparing it to any other porro, especially the Nikon E2 which is a pain to use below 5 meters. I am crazy about colours, it´s a disease that came with passion and profession. I tried to do a more objective investigation into colour reproduction (the whole story and methods here) and photographed from the objectives into the binoculars. This is the Ultravid 8x42 and it is slightly warm in colour. 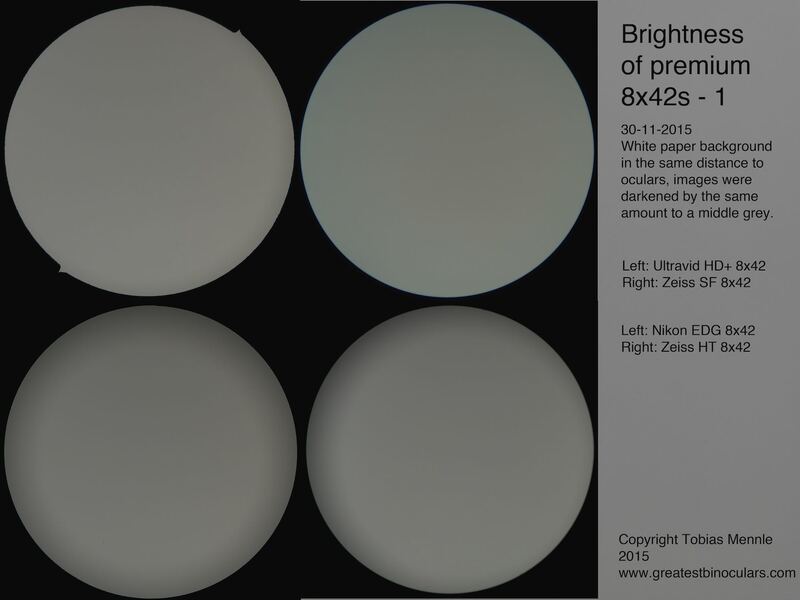 This is the Zeiss SF 8x42 - can you see the difference? Hardly. But wait. 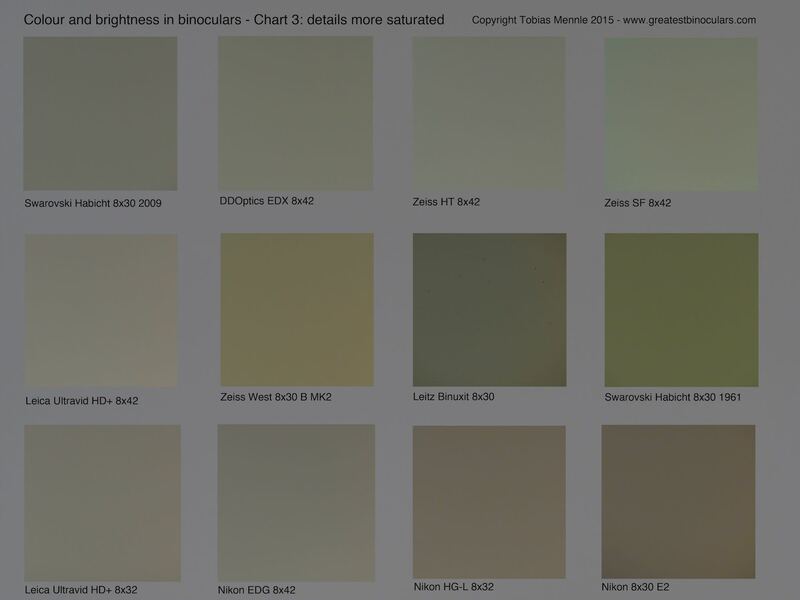 The point is: Looking at white you will hardly see any color cast, for a couple of reasons - the logarithmic nature of our vision which makes us unsensitive to brightness and colour differences in highlights, but emphasizes shadows and midtones. Plus, the fact that highlights are normally white or should be white and the brain will strongly correct for this. So yes, your white egret will look white even with the Zeiss SF. When a hard-boiled binocular fan complained to me about grey harriers looking grey-green observed with the SF I realized that this fit with my experience -"it´s the midtones, stupid" - I really resent to watch the brown-grey bark of my apple trees with the Zeiss SF, they look weird, and my red bird house just looks subdued in colour, as red is weakened by the complementary colour cast of the SF. Our vision is optimized for shadows and midtones, here we can discern much smaller differences in brightness and colour casts. So I zoomed into the center of the images to find a uniform patch and get rid of vignetting, and then lowered the brightness, just that white would be mapped to a middle grey. I did not touch colour, just reduced brightness , this makes colour casts more visible. For this review, it is interesting to see the as neutral as it gets Habicht 8x30, next to the slightly warm, very bright Leica Ultravid. 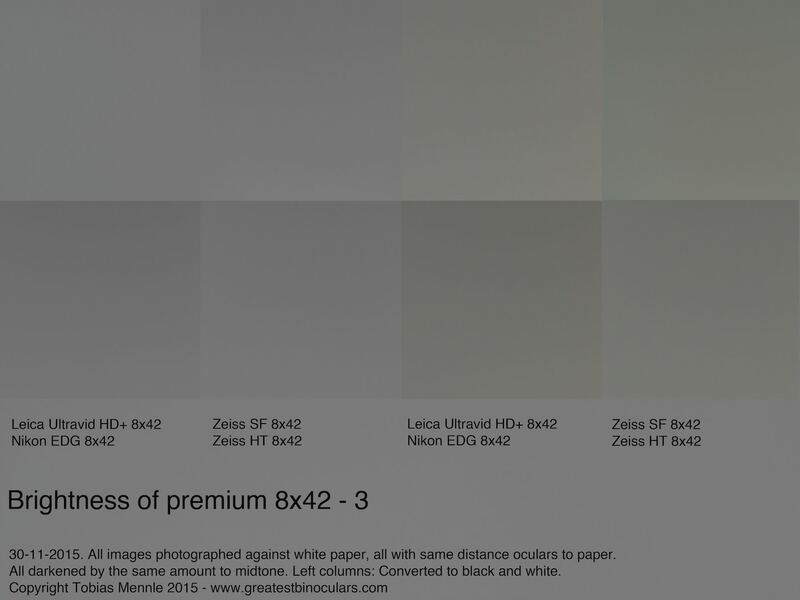 The Zeiss HT has a slight hint of green, and the Zeiss SF definitely has a very distinct green cast. The Nikon EDG is almost neutral with just a touch of red, almost a Nikon trait as the last row of images suggests. 1. Nikon EDG, Swarovski Habicht, Zeiss HT - all are reasonably natural to my eye. 2. Slightly warmer: Leica Ultravid. This makes total sense, as images look even great in blue shadows. 3. Even a bit warmer: Swarovski SLC. 3. Colder: Swarovski Swarovision. A bit too cold, probably to increase brightness in colour vision, especially in low light, when a light blue becomes the brightest colour. 4. Warmer with green cast: Zeiss SF. 1. Swarovski Habicht, out of competition, so: Leica Ultravid. 2. Nikon EDG - neutral with extreme colour saturation but a bit dark. 3. Zeiss HT - neutral, but a bit undersaturated due to very high brightness. 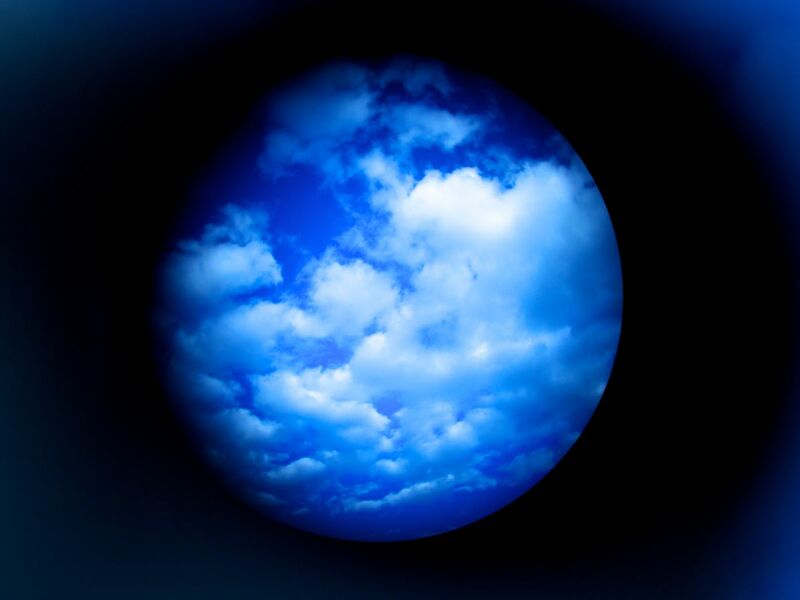 Here we have an interesting observation and the question "can a binocular ever be too bright?". 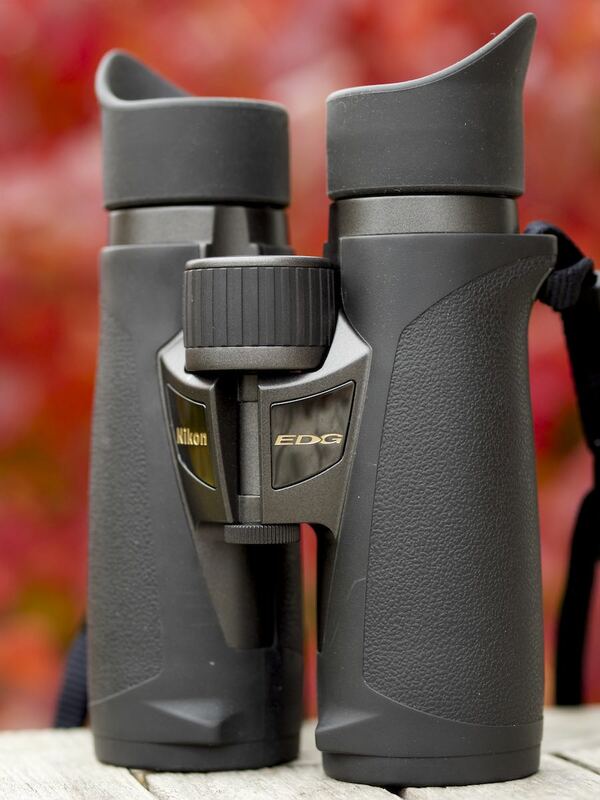 I would love to compare with the previous model, the Victory Fl 8x42. 4. Swarovski SLC - similar to Leica, but lacking the HT sparkle. 5. Swarovski Swarovision - unnecessarily cool. 6. Zeiss SF - warm and too green, although there is some evidence that a slight green cast is almost a Zeiss heritage. Generally, brightness is difficult to rate, and for me the most important thing is the visible sparkle the new HT glass brings to Ultravid and Zeiss HT, but this is much more about beauty, emotion and aesthetics than about functionality. 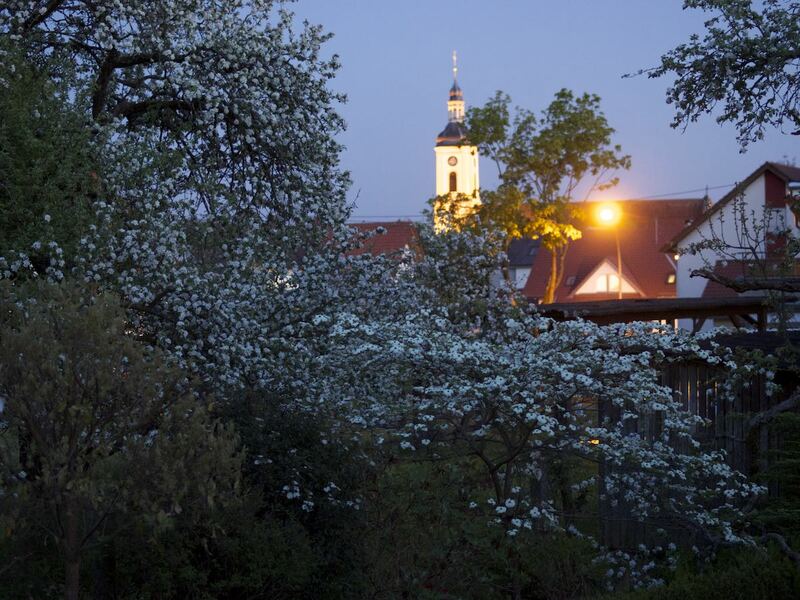 Even in beginning twilight, where brightness differences may be most important, I was not able to see more usable details with a Zeiss HT than with the quite dark Nikon EDG. In night vision, I see no differences at all. Again, photographing through the objectives brought more evidence. To my eyes Ultravid and SF look brightest here, with the EDG looking a bit darker than the HT. What happens if we turn this to black and white to block out the colour casts? It is fair to say Ultravid and SF look brightest and Nikon looks quite a bit darker than the other 3. 1. Zeiss HT (95% transmission and Abbe König prisms), relative to objective size: Swarovski Habicht (96% transmission). Images look so great all day, even on a bright noon, not only at night or in the twilight. 2. Leica Ultravid - the first Schmidt-Pechan prism system with high transmission sparkle, beautiful. The photography does underpin this. 3. Swarovski Swarovision - cool colour cast yields bright images, although transmission (90%) is 2% less than in the SLC and SF. 4. Swaroski SLC, Zeiss SF - both have about 92% transmission, but the high contrast and warm colours sometimes make the images look a bit darker than the competition. More on colour and brightness here. Let´s face it: chromatic aberration is something we need to live with in binoculars. All samples are CA free in the very center, with the viewer aligning the pupil tight on axis without tilting. All samples show some CA towards the edges. 1. Zeiss SF, Swarovski Swarovision - state-of-the-art low in the central part of the image. 2. Nikon EDG, Leica Ultravid, Swarovski SLC, Zeiss HT - very low, and really not significantly worse than in the above two for my taste. Using a second Leica Ultravid sample and being very careful about my position when judging CA I would no longer claim the Leica features visibly more CA than the competitors. 4. Swarovski Habicht - a bit more than in the others, but very acceptable. No point in ranking, Leica clearly aims for compactness and the Habicht is from another era. 2. Swarovski Swarovision - the easiest view with regards to roaming around in the image just by eye movement. Awesome. Much more flare than the EDG though. 4. Swarovski Habicht - more difficult for beginners, with a lot of distracting peripheral flares, but great when you´ve found your personal sweet spot. I had a conversation recently with a representative of one of the most renowned sports optics manufacturers. They estimate that hunters account for 75% of their sales, but see the nature observation market as having a huge potential to develop in the near future. 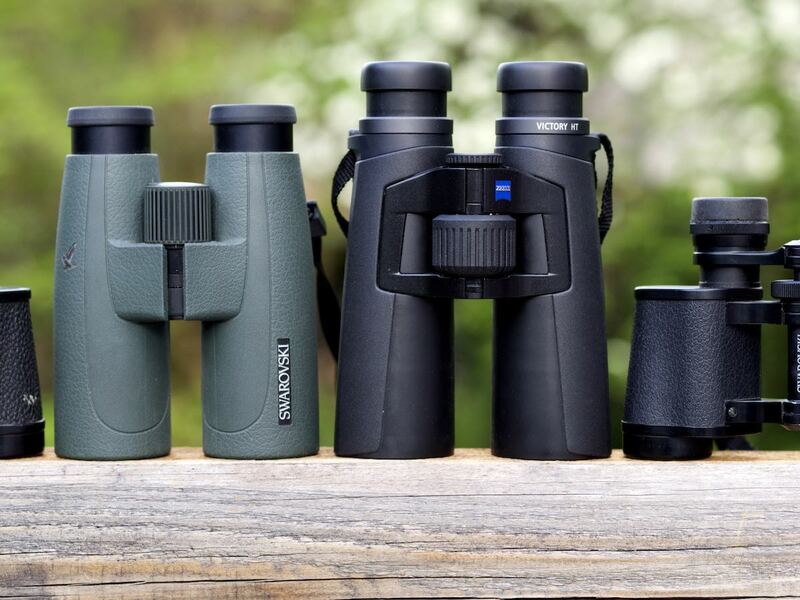 Sounds like good news for all binocular fans, both hunters and birders - we can expect further evolutions, maybe revolutions in binocular design. 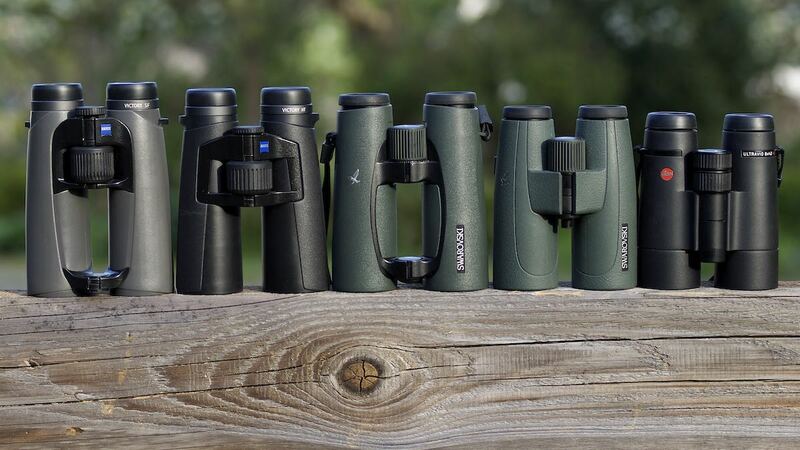 Is there any sense in trying to classify the reviewed 8x42s into hunting or birding glasses? 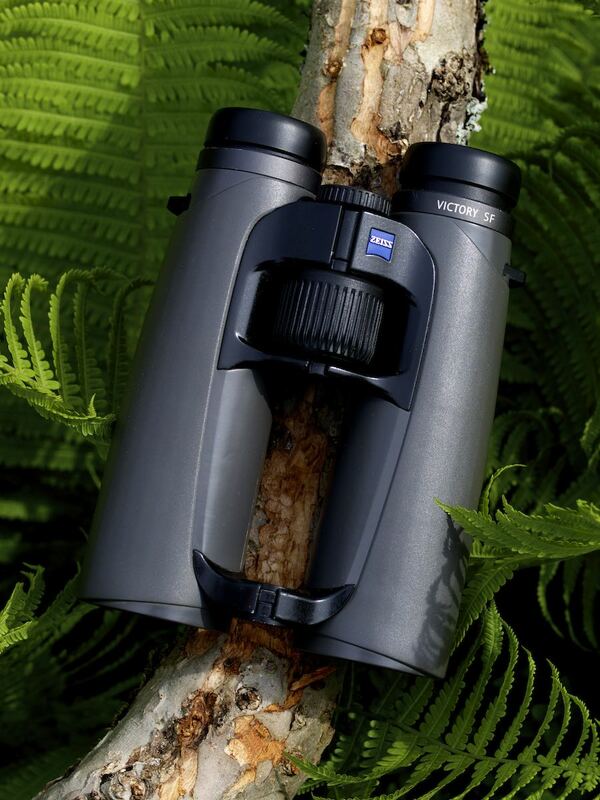 To my eyes the Zeiss HT is the brightest glass and high transmission would be thought of as indispensable for hunting glasses. But in late twilight when I could still clearly see colours I was unable in handheld use to get more useful detail from a scene using the HT instead of the visibly darker Nikon EDG. Maybe contrast is way more important in such situations than brightness, and both glasses are excellent in that respect. I came to love high transmission not because I will see more in twilight or darkness, but because of the more sparkling images, more vivid colours even on a bright day, as seen in the Ultravid, HT or Habicht. High transmission beautifies an image, makes it glow, makes it more emotionally appealing. Birding most of the time is more about emotion than anything else, so we should really see HT glass in all premium binoculars in the future. 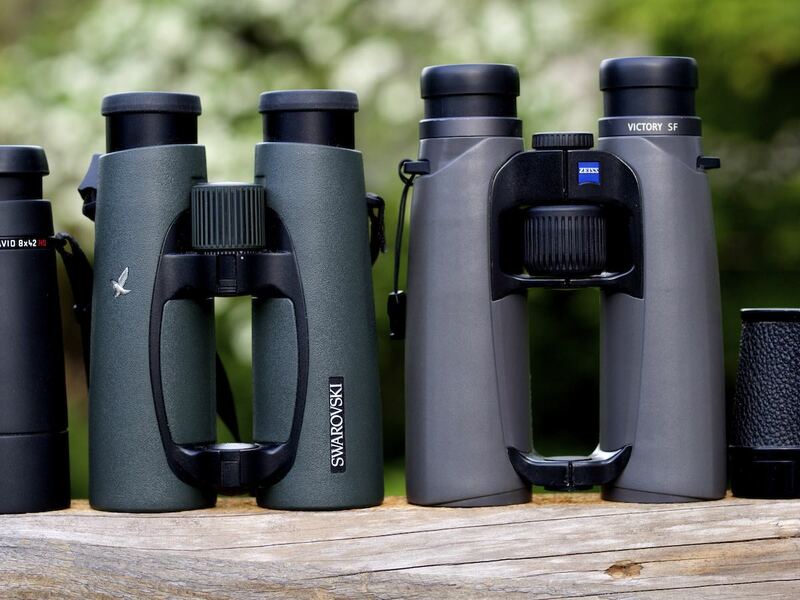 Another paradox: Zeiss has the warm high contrast SF advertised for birding, Swarovski has a very similar look in the SLC, which was rather conceived as a hunting glass as it allegedely lacks the last bit of colour accuracy birders might want. 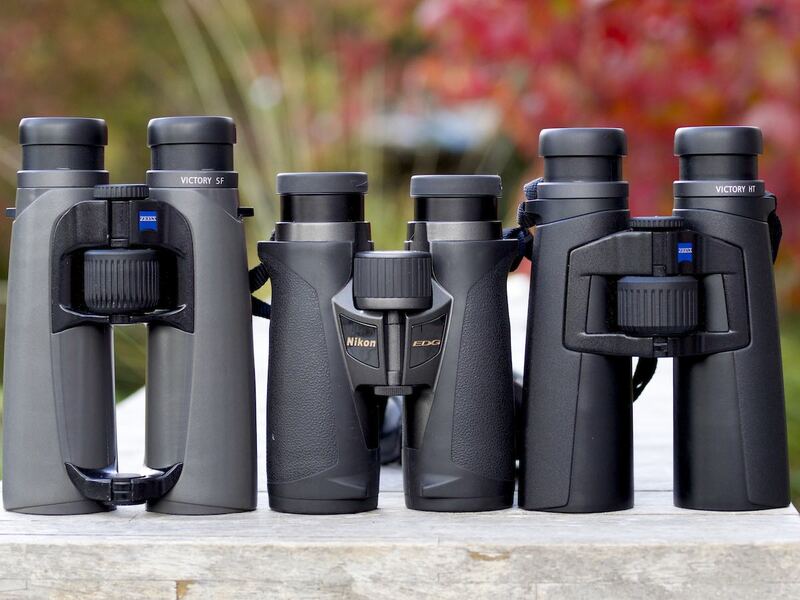 The Zeiss HT is neutral in colour and surely the prime hunting glass of the lot, but its very good threedimensionality should an extra advantage both in hunting and birding to localize objects in dense vegetation or low light. So, in the 8x42 class it seems to me to be much more about matters of taste than about hunting vs birding glasses - for example about flat field vs. curved field. The Leica Ultravid 8x42 HD Plus offers compactness, great mechanics, best looks, and extremely beautiful high contrast images with saturated colours - and a high transmission sparkle other SP prism designs don´t have yet. 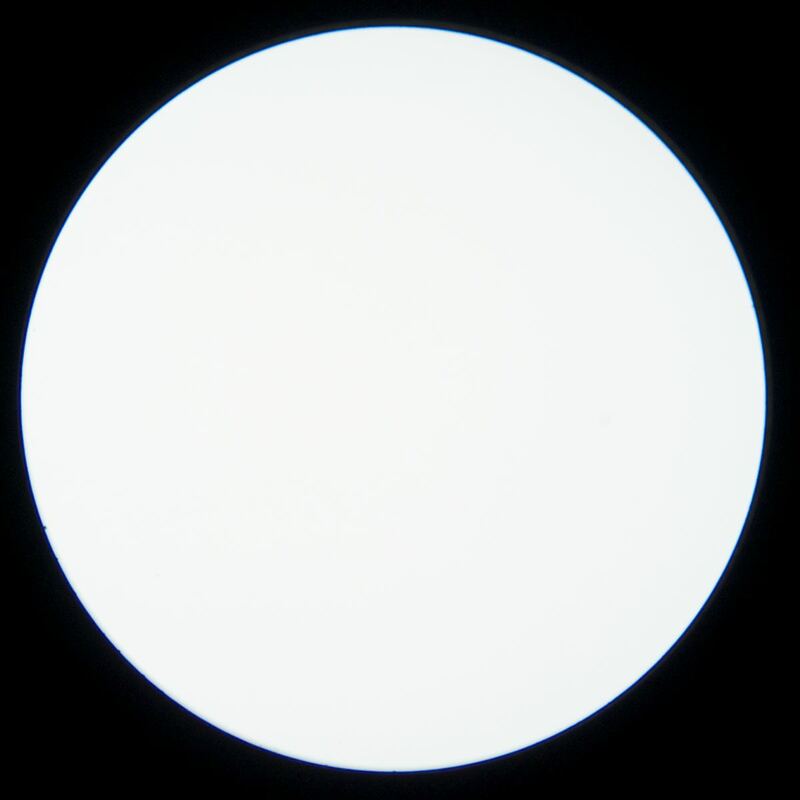 It is more prone to peripheral flaring than the others, but the beauty of the image center is magic. The Nikon EDG 8x42 has an almost perfect combinations of great qualities optically and mechanically, and amazingly smooth focusing and the state-of-the-art flare suppression. It´s really a shame it is a bit on the dark side, but the future should be brighter, and Nikon may then seriously challenge the European manufacturers. 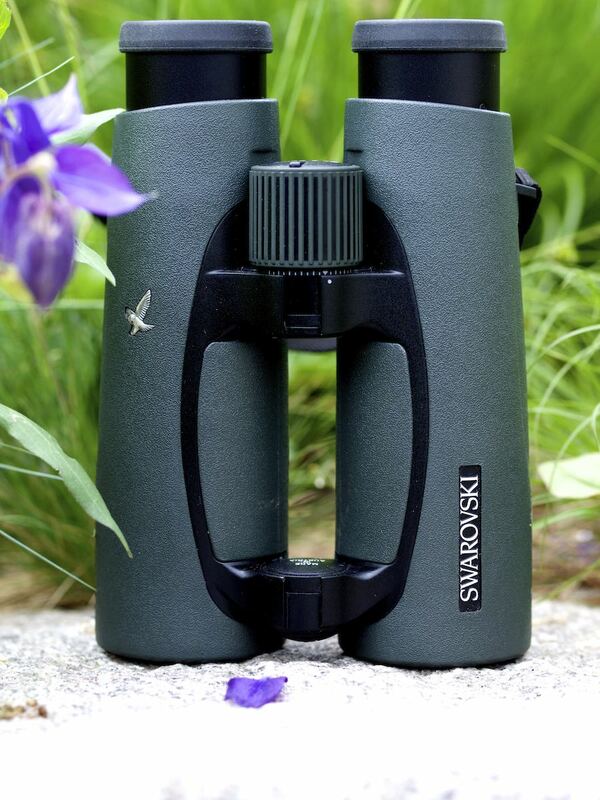 The Swarovski SLC W B 8x42 has a good price performance ratio in the US market - if you get a sharp sample, it is a great glass and great buy. In Europe I´d rather try a Leica or Zeiss HT first as they have almost the same price and are uncompromised high end glasses. Swarovski should change their strategy about these bins, they need to be a real alternative to the Swarovision. Strangely, the high contrast approach is for hunting, but at the same time makes images look a bit darker than expected, and Zeiss aims at the birding market with a similar approach as seen in the SF. 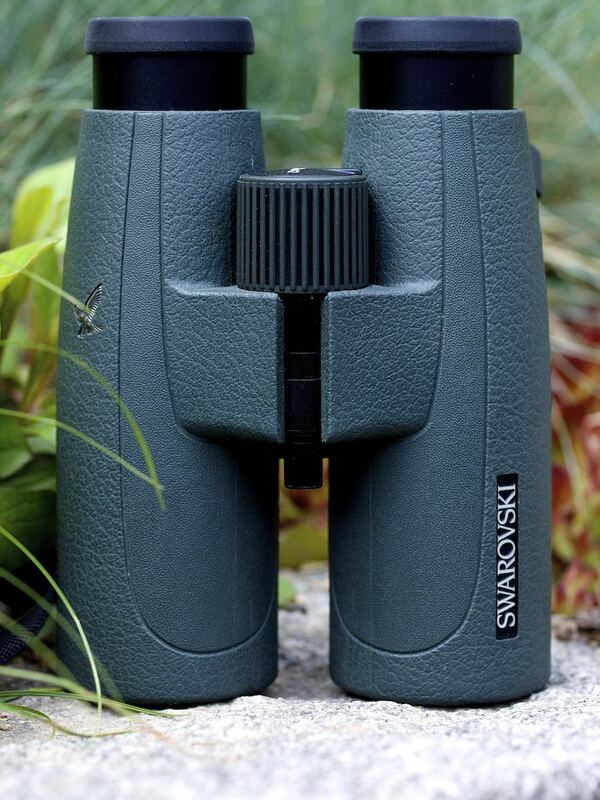 The Swarovski EL 8.5x42 Swarovision is a Swarovski wonderglass, a revolutionary and mature design and the only real flat field bin, with images that will impress any viewer with sharpness to the very edge of the field. Great ease of view and wide field of view. The only faults are a higher flare level than average and the flat rendering of space, but if you need sheer analytical power with greatest ease of use more than the beauty of space and best flare resistance, get a Swarovision. The SV 10x50 should be very similar. The Zeiss Victory HT 8x42 is a Zeiss masterpiece for people who want and appreciate the sharpest, brightest, most natural view in the image center, perfect panning with no rolling globe, the excellent threedimensionality, and the extremely "quiet" images due to superb flare suppression. The Zeiss Victory SF 8x42 has probably the best ergonomy for people with very big hands, the widest field of view and like the HT very quiet images due to excellent flare suppression. Make sure though that you don´t suffer from rolling ball effect and don´t mind a slight green colour cast. 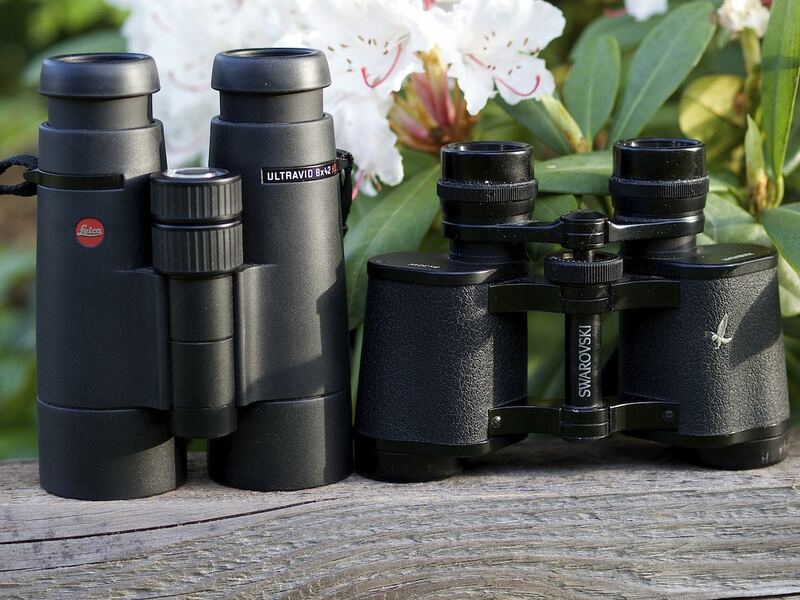 OUT OF COMPETITION: Swarovski Habicht 8x30 W. Sharpness, contrast and colour are reference for a fraction of the price of the 8x42s, it is tiny and indestructible, but it does suffer a lot from flares and needs a bit of practice to get the most out of it. Spectacle wearers may find the eye relief to be too short. More details in the reviews. 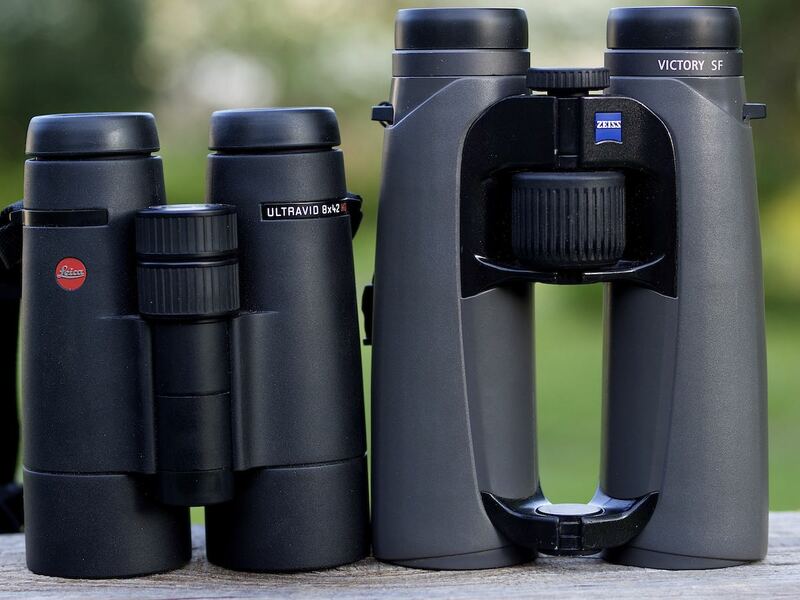 In my finale of this review, the Nikon EDG exploded like a bomb in my binocular cupboard, as it is an almost flawless binocular, except that it just cannot offer the high transmission sparkle that makes the Ultravid and Zeiss HT images glow. The future should be brighter... an EDG MK3 with HT glass would easily be the best 8x42. The Zeiss HT is hands down the most impressive optical design, but for me less ergonomic than the Nikon and the Leica. Zeiss should really think hard about the next versions of the HT and maybe sacrifice a bit of performance for compactness. Were the predecessor models a better approach ergonomically? It was very hard to give back the Swarovision, one of the best glasses I ever used and a great technical achievement, but I do not need flat field and just could not get used to the flat reproduction of space, and the comparatively high flare levels. The Zeiss SF design has great potential, but for now it just cannot match the HT´s excellence neither dethrone the Swarovision yet. I strongly resent the rolling ball effect and colour reproduction and Zeiss should mend these design faults for this model and upcoming designs. An 8x32 SF should be about excellence, not pushed specifications, and it should be easier to improve on the Swarovision 8x32 than on the 8.5x42 Swarovision.The SLC for European buyers is somewhat superfluous at the moment, that might change if Swarovski either improved the design or decided to build an uncompromised 8x32 version of it and gave it a tasteful industrial design and finish. Anyway, we should have a real premium 42mm curved field model from Swaroski, no matter if they call it EL again or stay with SLC. The Habicht is out of competition, an all time favourite. 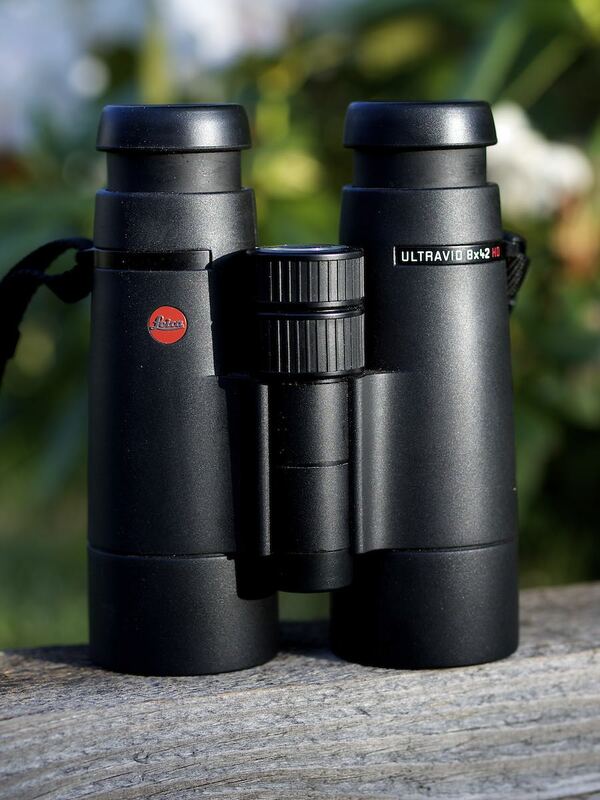 In the end, the Leica Ultravid HD Plus proved most irresistable and turned out to be the best binocular for my needs and taste - compact and very easy to hold, with warm, saturated, glowing colours and superb contrast, breathtaking in sunshine as well as on a dull day or in the twilight. Premium binoculars cannot be manufactured easily and cheaply, and the war of attrition regarding specifications - wider field of view, flatter field of view, closer focus - makes it all worse. Unlike really professional high end optics produced for cinematography and photography and their big enough markets, there are probably no binoculars with faultless quality control. If all samples on sale had the quality an expert buyer expects for his hard earned money prices would rise astronomically. 2000 Euro/USD are obviously not always sufficient to get a great binocular. This is a very inconvenient truth, and it is always embarrassing for me to complain about faulty samples of premium binoculars. But we are looking at two advanced optical systems which have to focus in synchronicity from -40 to 60°celsius, and be waterproof, and withstand hardest abuse. On the other hand the market mechanisms are ruthless and manufacturers cannot have their margins melt away with strictest quality control. The competitors will have exactly the same problem, that might help. Anyway, you always need to trust your own eyes and decide for yourself. Good luck, and enjoy your binoculars. This is the essential quality of great binoculars: To enable us to break on through to the other side... such a totally transparent, out-of-the-open-window view - an experience, a revelation - is a somewhat rare thing. There is a border that needs to be crossed, a door that needs to be opened - I want to totally immerse into the image for hours of observation without any hassle. This is not to be achieved without a lot of effort, and it is something lesser glasses rarely offer, as it is not a simple linear relationship between increasing price and an increasingly better view. It is about a minimum level of excellence, and that is a difficult task to master.